The Bond End Canal was once an important link between the Grand Trunk Canal and the river Trent. Jannel Cruisers started business in 1973 in the tiny part that was left of Shobnall Basin. The Hines family reopened the basin and in 1980 created a dry dock on the line of the Bond End Canal. The original lock entrance walls can be seen at the entrance to the dry dock. The track of the Bond End Canal can be followed from Shobnall Marina, down Shobnall Road, over the railway bridge, along Evershed Way to St Peter’s Bridge at Bond End. However, Shobnall Marina is the only section still in water – hence anyone who uses Shobnall Marina’s dry dock can be said to have truly travelled to the ‘head of navigation’ of the Bond End Canal. Use of the river Trent, which runs through the town, had been tried since Roman times but the further inland, the smaller the boats that could be used. The winter flooding and shallows in the summer proved insurmountable, however cargo could be carried from the sea as far south as Wilden Ferry, where the river Derwent joins the river Trent and increases the quantity of water, then onwards by road. For example Staffordshire Waterways, by Staffordshire County Council Education Department, makes reference to (1765) “Great quantities of flint stones used by the potteries in Staffordshire brought to Hull and thence to Willington in Derbyshire to be forwarded by packhorse; and the fine ale made at Burton upon Trent and exported to Germany and several parts of the Baltic”. Hops, grain and malt were also carried to Burton via the river Trent. In the early 1700s, improvements were made between Wilden Ferry and Burton to increase the depth of navigable water. Locks were built and the Burton Boat Company, under Henry Haine, prospered. Cheese, ale and pottery moved downstream and iron and timber upstream to and from the wharves and warehouses built on the river Trent at Bond End, just south of Burton Abbey. Bond End was so-called after the area outside the Abbey walls where the bondsmen and serfs, who served the Abbey, lived. Burton was now said to be the inland port the furthest from the sea. Canals were gaining favour. A note found in the archives of the Staffordshire County Council says “It is another circumstance not unworthy of our notice in favour of canals, when compared with river navigation that is the conveyance on the former is more speedy and without interruptions and delays to which the latter are liable, opportunities of pilfering and other small goods stealing and adulterating wine and spirituous liquors are thereby to a great measure prevented.” With this thinking in mind, a canal to join the rivers Trent, Mersey and Weaver was proposed and surveyed in 1758. The Enabling Act was passed in 1766 for the canal to be constructed from Wilden Ferry to Preston Brook. The Burton Boat Company, concerned at the loss of trade from their warehouses and wharves at Bond End, approached James Brindley, the engineer, to terminate the canal near Burton at Bond End. Brindley, considering the fluctuating water levels north of Burton to Wilden Ferry, refused the Burton Boat Company’s proposition. By 29th September 1772 (Brindley died on 27th September), 48 miles of the Grand Trunk Canal (now known as the Trent & Mersey) from Wilden Ferry to Stone was navigable – the length past Burton-on-Trent being completed in 1770. Having been unsuccessful in persuading the promoters of the Grand Trunk Canal to modify the route, the Burton Boat Company, in 1769/70, built a 11/8 mile canal from their wharf at Bond End to Shobnall (the name deriving from Schobinhale, a family of Saxon knights) to connect the river Trent to the new Grand Trunk Canal. However, the canal company refused to allow a connection to the canal and a situation, known as the Shobnall Bar, ensued with boats each side of the bar having to be unloaded and reloaded. Whilst the reason of the canal company may have been to deprive the Burton Boat Company of trade and keep it on the canal, this was only partly successful as goods could pass both ways on the river using broad beam barges, whereas the canal was only broad to Horninglow and was narrow passing through Burton and onwards to Middlewich. The Burton Boat Company tried to gain trade by breaking through the bar overnight, but litigation followed and the bar was reinstated. Eventually a connection was allowed in 1794 and, as the Bond End Canal was at a lower level, a lock with a fall of 3ft 9in was constructed. In 1792/93 plans were published to build a canal from Burton, on the east side of the river to transport coal from the Derbyshire coal field. It was further proposed to join this to the Ashby Canal at Ashby Woulds and plans included an inclined plane near Newhall (predating the Foxton Inclined Plane by 7 years). There were also plans published around the same time for a canal to be built to the west of the Turnpike (now the A38) in competition to the Grand Trunk on the west side. This canal would have started where Bridge 88 now stands on the Coventry Canal, have 8 locks, cross the river Trent downstream of the present canal river crossing and join “Mr Peel’s Cut” at Bond End. “Mr Peel’s Cut” was made on the river Trent to supply power for the water wheels and water to the cotton mills opened by Robert Peel, a forebear of Sir Robert Peel MP – known as father of the police force. This cutting was also the termination of the Bond End Canal. None of these plans came to fruition. It is interesting to note that these plans show the continued existence of the Shobnall Bar; indicating that the connection had not been made at that date. In 1840 plans were published in another attempt to extend the Ashby Canal to join up with the Bond End Canal across the river Trent. About the same time there were plans to extend the Caldon Canal from its terminus at Uttoxeter to joint the Grand Trunk at Horninglow. By 1843 the canal was used in a different way to solve a common problem of the times – sewage. The brick sewer built sometime after 1788 was liable to blockage and in 1843 the system was extended 2,159 yards to reach from the Trent Bridge to the Bond End Canal. A system was built connecting the sewer to the lock alongside the river so that every time the lock was used, water was forced through the sewer acting as a flushing agent. The quoted number of boats using the lock was 12 per day so allowing the sewer to be flushed 12 times a day. The Birmingham & Derby Junction Railway brought their lines to Burton in 1839 with the first train arriving on 1st August. A spur line was built, from where Burton Station now stands, turning 90 degrees to terminate at the wharf alongside the canal. The main line crossed the canal on a moveable, probably swing, bridge. This was the site of an accident in 1846 when a railway porter, forgetting the imminent arrival of a train from Derby, turned the bridge to allow a boat through and the train engine ended up in the canal. Fortunately there were no fatalities but this led to the building of a fixed bridge that remained in existence until 1986. The junction of the Bond End and Grand Trunk canals became a busy wharf and a public house, Mount Pleasant Inn, stood at the junction. There was never any road access to this establishment, known locally as “Bessie Bull’s”, nor was it equipped with beer pumps. 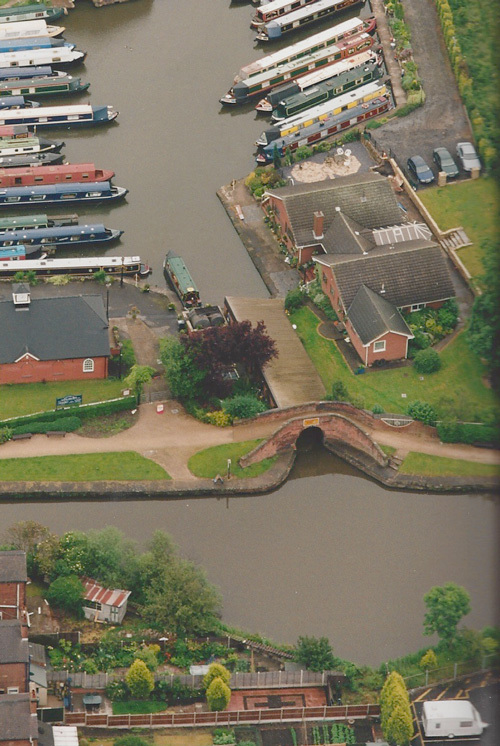 Until its closure in 1961, beer was delivered from Marston’s Brewery across what is now the Trent & Mersey Canal and was drawn from the wood in the cellar. Thomas Bull, the landlord at the time of the pub’s closure, was the last of a family line to hold the pub’s licence that went back 102 years. The nickname of “Bessie Bull’s” dates to the last landlord’s grandmother, who took over the licence when she was widowed. It is thought that the pub may date to before the canal when it was understood to be called The Gateway to Sinai, a reference to nearby Sinai Park where a retreat was built for the Abbott and monks from Burton Abbey. The public house was demolished in 1962 and the Hines’ family home now stands on the site. The original tiled cellar was exposed during the modern bungalow’s building. The Bond End Canal inevitably succumbed to the railways and by 1872 had become more or less disused. In 1874, one mile was infilled leaving the wharf at Shobnall as a transhipment point and sidings. Five railway lines were built around the basin and were in use until the 1950s. 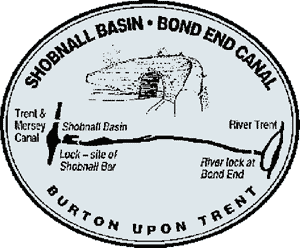 The North Staffs Railway Company laid its lines to Burton alongside the Trent & Mersey Canal, turning at right angles at Shobnall to enter Burton on the infilled bed of the Bond End Canal. A railway complex was built to serve the local breweries and the last train to use the line from Burton into Bass & Co’s maltings up the bed of the old canal to Shobnall was in 1974.